Taking the classic sliding puzzle into a new age. 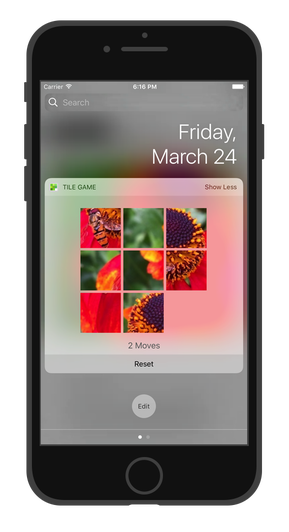 Tile Game Classic brings the timeless sliding puzzle into a new, modern age. Play from anywhere on your iPhone in Today view in Notification Center - even when your phone is locked! Taking inspiration from macOS's Dashboard's Tile Game widget, Tile Game Classic lets you experience a classic game, but now on iOS. Choose from the 3x3, 4x4, or the fiendishly tricky 5x5 grid, and one of three photos - or choose your own. The photo you choose will be split up into multiple pieces which are then randomly shuffled. Then you have to set out rearranging it - how quickly can you manage it?! Each tile moves with one tap - the controls are one of the easiest things you will ever learn, but the skill which is required to solve the puzzle will not be. Are you able to think two, three, four (and more!) moves ahead? In memoriam, Dashboard.app: gone, but never forgotten. 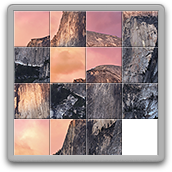 Tile Game Classic was conceived after recognising the decline in resources devoted to Dashboard on macOS - many widgets haven't been updated in years, with Notification Center being pushed as the natural replacement. But there was one thing missing - Tile Game. We created Tile Game Classic to bring the Dashboard mainstay to Notification Center - not content with limiting it to macOS, we also created an iOS version. This is one of the only games you can play on iPhone or iPad without opening the app. Just swipe down and play on the Lock Screen.